Prepare a baking tray by lining with parchment paper. Preheat the oven to 220 C. Lightly dust a flat surface with flour. Sift together the both flour, ginger powder and baking powder; put into a food processor. Then add the dried rosemary. Pour in the melted butter, spread and oil. Blender to form the mixture into coarse crumbs. Empty into a medium bowl and fold in the cheese and chorizo, making sure all is evenly distributed. Form a well in the center of the mixture. Using a bowl, whisk together the sour cream and egg. Pour egg/sour cream batter into the well that was formed in the flour mix. Using a wooden spoon or large fork, stir all until combined into a dough. Empty dough onto prepared surface and knead, about 10 to 12 turns about 8-10 minutes. Roll dough into flat mass that is 1/2 an inch thick. Cut into circles with a biscuit cutter. After all is cut, you should have 27 scones. Place all on prepared tray, fitting all 20 closely together but not touching.The other 7 use separate tray. Spray with oil on top. 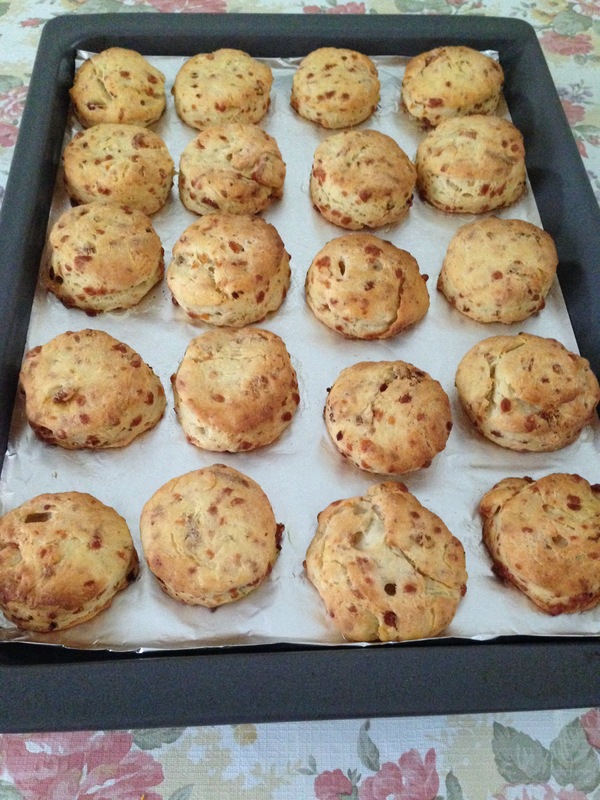 Place scones in oven to bake for 15 minutes. They will be lightly golden on top and bottom when done. After baking, transfer scones to rack to cool. Serve with jam and whipped cream. I prefer to have with spread margarine and a dollop of chili oil. As it is savoury so make it spicier.